Deluxe Round Traditional Round table. A round table is one of the best tables to use in the home or office. You can use round tables as meeting tables. Use round tables to facilitate equal arrangement of formal and informal communication. These tables can be arranged in any office area or room because of their ideal size and shape for group work. Place a round table in the center of a room to establish a gather round area. Round tables are great for quick meetings and quick updates with clients. Place your favorite club chairs around your round table. You should note that chairs with curvy lines go wonderful with round tables. It’s the perfect setting to enjoy small lunch or drink gatherings with clients and co-workers alike. Place it near a bookcase to improve work productivity. For relaxation and work, round tables come in handy. A round collaborative area is a must have! 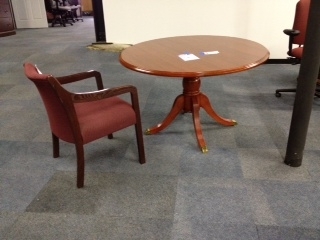 Make it known your office is clearly social with traditional round tables from Mark Downs Office Furniture. This entry was posted on Friday, August 17th, 2012 at 2:03 pm. Both comments and pings are currently closed.